Don’t let the rumors scare you… flying with kids might be intimidating at first, but the awesome memories are so. worth. it. The first trick to becoming a professional-traveling-parent: protect that precious car seat! Our bright red Gate Check Bag has been the go-to travel bag for parents for over a decade and with good reason. You simply pull this surprisingly large bag out of it’s attached stretch pouch and place your car seat inside. Then use the draw-string and lock to keep your investment (and yes, as parents, we know just how much of an investment a car seat can be) protected from dirt and germs. 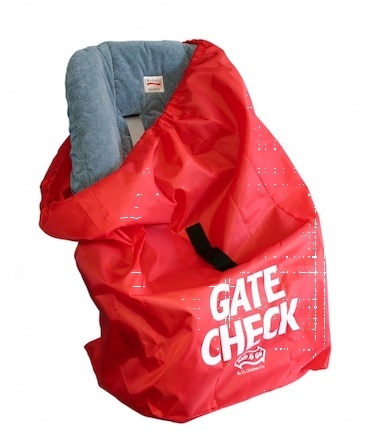 When you hand over your gear at the airplane gate, you can rest easy knowing that the durable fabric, bright red color and large GATE CHECK logo will ensure that your car seat is protected and safely returned to you at the end of your flight. You pack the snacks… we’ve got the car seat covered! Please note, this bag is not recommended for baggage check.